Today’s “smart” appliances are more efficient and customizable than ever. But do all of their bells and whistles make repairing them more daunting and expensive? Look at the facts. There is no doubt that fixing your high-end machines, including Samsung appliance repair, will cause a bigger hit to your pocketbook these days. 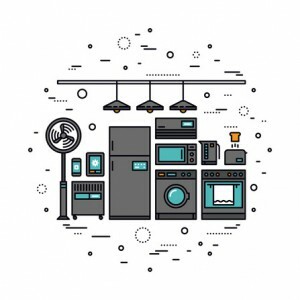 That’s because today’s appliances contain many more complex electrical controls, whereas earlier models operated on simpler, more mechanical mechanisms. In the past, a handy homeowner could often single-handedly repair a washer, dryer or refrigerator, but diagnosing and remedying today’s complex circuit boards and brains usually needs to be left to the experts. As a result, the average repair cost has nearly doubled. The presence of electrical controls has had another unintended consequence: Appliances are breaking down sooner. Mechanical timers may seem clunky and graceless to us, but they are much less susceptible to fluctuations in power than today’s circuit boards. This fact also raises the overall cost of maintaining a “smart” appliance. That’s why many consumers are opting to purchase used or “old school” home appliances instead. They still do the job, while requiring fewer and usually less costly fixes. On the other hand, if it is important to you to be on the cutting edge, you might want to consider buying a whole-house surge protector. While these are costly, ranging anywhere from $300 to $850, they can reduce the influence of damaging power fluctuations. There are a few other relatively simple strategies that you can adopt to prolong the life of your appliances, “smart” or otherwise. For example, don’t overload your clothes washer; doing so puts too much stress on its delicate moving parts. In addition to always cleaning your dryer’s lint trap, hire a technician to remove the dust and fuzz that collects on the inside of your dryer. Your appliance repair specialist can also do wonders in prolonging the life and energy efficiency of your modern refrigerator by cleaning its condenser coils. Again, this is not a task for an inexperienced homeowner. With the adoption of any exciting innovation come trade-offs, and “smart” appliances are no exception. As a savvy consumer, your best bet is to explore your priorities. If you are an early adopter who values up-to-the-minute capabilities even if they mean an added financial investment, dive into the full range of amazing products that the major manufacturers are rolling out. You are sure to find a model that does more than you ever thought possible. If you instead prefer to stick with simpler items that you might even be able to repair on your own, there are plenty of well-preserved products that are readily available. The choice is yours.